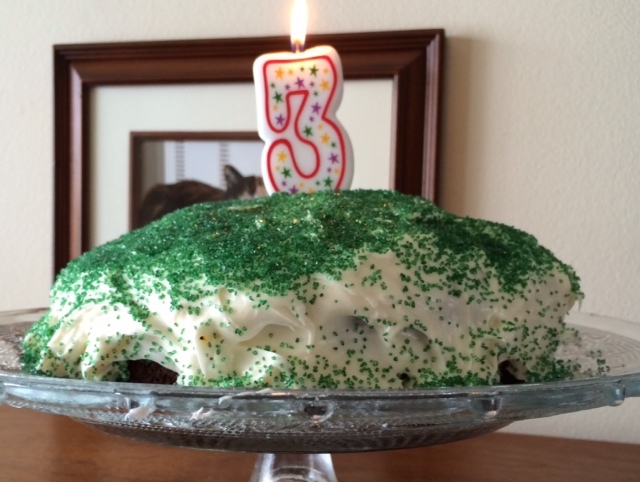 Today our blog turns three. Postcards from Purgatory can draw a circle, walk in a straight line, and climb stairs easily, using alternating feet. It still has tantrums. It’s reliably toilet-trained, but sometimes when it is stressed or overwhelmed and can’t express these feelings in words, it crouches in a corner and poops in its pants. It is beginning to show signs of empathy. Its artwork contains recognizable subjects and 75 percent of its speech is comprehensible to others. It holds crayons in its fingers rather than in its fists, is afraid of monsters, and is able to make choices between two things. Its favorite activity is pretending to be a princess. Coincidentally, we are on track to make today our most-visited day ever! If everyone who reads this post clicks on a couple of categories along the sidebar, we’ll stand a pretty good chance of meeting our goal. Want to know what the big deal is about PAT CONROY MONTH!!!? Click here. Wonder what we mean when we talk about “man books” and “woman books”? Click here. Better yet, just scroll down the categories list and find an author or topic that appeals to you. Want to share our site on your own social media pages? Go right ahead! Thanks for helping to make today a third birthday to remember, and – as always – for reading our blog. This entry was posted in Important PFP Milestones. Bookmark the permalink.